Durco Filters Filter Presses are ideal for batch filtration of liquids and slurries with high solids loading (3-30 wt%). If it can be pumped, it can be filtered in a filter press. Sometimes referred to as Plate and Frame Filters, filter presses generally work in a "batch" manner to filter or dewater slurries or sludges. Individual, cloth-covered filter plates are pressed together with hydraulic rams forming a filter vessel with internal cavities. The feed pump sends the slurry into the filter press where the clean filtrate passes through the filter cloth leaving behind the solids in the form of a filter cake.The filter plates are separated at the end of the filtration cycle and the solid cake is discharged by gravity. The filter cake can be discharged or recovered as a solid. Final liquid content of 20% to 30% is typical. Filter cake can be further dewatered in a Sludge Dryer. Durco Filters Presses are available in two different styles: EP and QP. 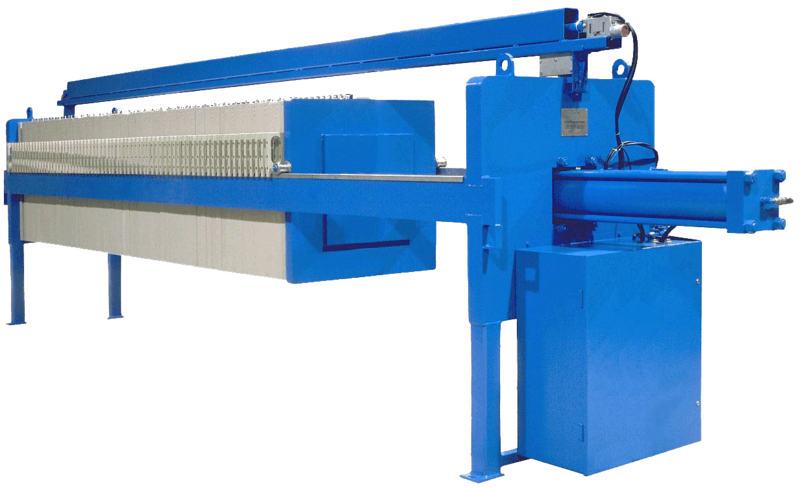 The EP Filter Press is a side-bar design used in many standard-duty applications. QP Filter Presses are heavy-duty four bar presses for applications with heavy filter cakes or special requirements.